Perhaps the best thing about this development is that it will cover the backside of Marriott Marquis. Does anyone know if airrights will be transferred from the theatres or were they used by the Marriott? I notice there are a few 1 million sq feet office towers going up. I'm wondering if land use wise thats so wise considering we are running out of room in Midtown itself and the West Side seems to be developing a little slow. Hopefully they can get some airrights from the adjoining area. Maybe he is keeping the old five buildings so he can transfer the air rights from them. Could that be possible? They would also get the air-rights by buying the buildings, tearing them down, and having a full block frontage which would make the property much more attractive. If they cannot purchase the buildings, they will offer to purchase the air-rights, but in no case do developers prefer to have holdouts just so they can use there airrights, its a consolation prize. Personally I hope the developer purchase these buildings and creates a substancial work of architectural on the block. 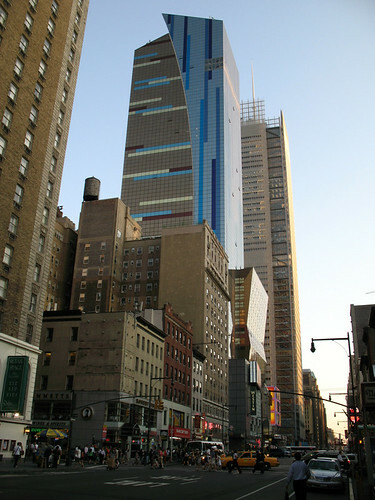 Hold-outs can contribute to the context or they could deter from the building, as is the case with 1 International Plaza. I dont see anything architecturally significant or worthwhile about these. Marriott went up in 1985. 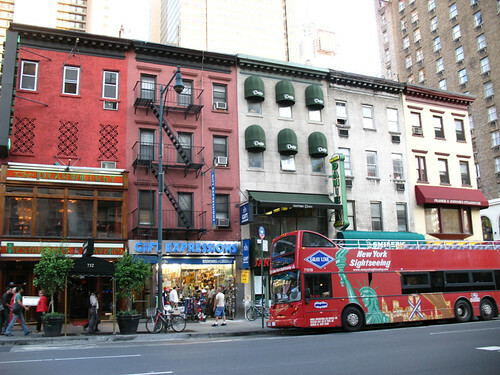 Theater Sub-District air rights transfers didn't go into effect until 1998. 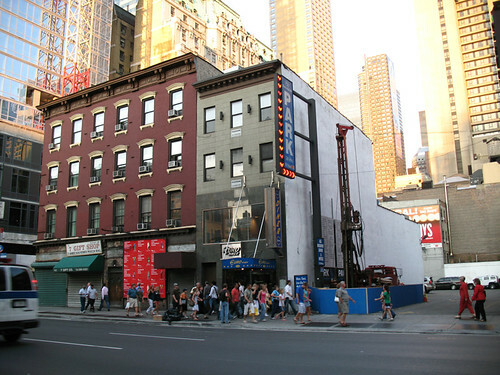 The Marriott property abuts the Music Box Theater on W. 45th, so under the zoning regs which existed when it went up in 1985 it's possible that those air rights were used. There are a couple of lots between the Marriott and the Imperial Theater on W. 46th, so those air rights wouldn't have been tranferrable at that time (Google MAP). 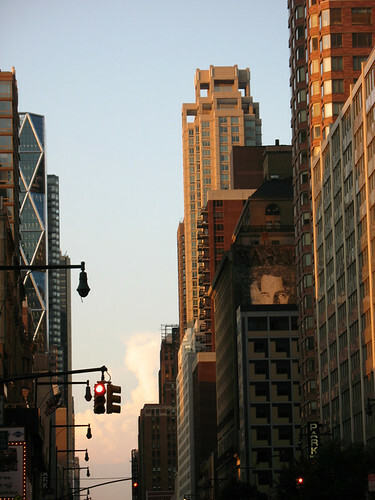 A NY TIMES article from 1998 (The Broadway Theater Still Awaits a Windfall Built on Thin Air) describes the problematic negotiations that were underway to establish the air rights transfers within the Theater Sub-District air rights. Great news. Finally a tower to go behind Marriott, and it's not some highrise condo infill (like the Platinum next door), but a solid 1msf office tower, which also should do a good deal of extending Midtown westward and finally creating some serious company for 1 worldwide Plaza. Last edited by Derek2k3; August 18th, 2007 at 03:23 PM. These types of buildings are easily replaceable if they want to do this. THey look pretty cheaply made to begin with. I actually feel pretty good about this one. But it does get to me that developers like Macklowe are purchasing 50 million dollar condos at the Plaza as the Drake goes down and a most forgetable short and visually non-stimulating box will rise in its place. 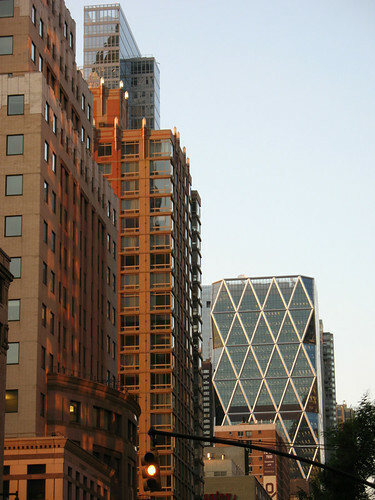 Midtown Manhattan is the most marketable place these days, and I want to see something really great buildings get built. Is this like wanting Alex Rodriguiz pull the Yankees through to win the World Series? Last edited by Scraperfannyc; August 19th, 2007 at 03:03 PM. Question: Does anyone know why NYC has so many small narrow lots, from way back? Is it because of the cost of the land? The above photo is a good example. The street grid was planned in the 1820's, I believe, in order to accommodate townhouses, like in the photo above. It gave each townhouse room for a little yard, with privy, in the back. People wound up buying individual lots for the most part, improved or unimproved. Does anyone remember when Hepburn was doing 'CoCo' and she asked the construction guys to take their break at a specific time on matinee days because the pounding was interfering with one of her soliloquies? I've heard that ^^^ story ... and that she went over to the work site and charmed the guys into doing what she wanted. "Coco" opened on December 18, 1969 at the Mark Hellinger Theatre, 237 W. 51st, just west of Broadway. "Miss Hepburn, what is your favorite heated beverage?" I assume given the state of the economy, this will not be built any time soon. Other than SJP's decent tower, we will get stuck with Macklowe's two P's O S at 510 Madison and the horrific, short, fat box at 440 Park.